By Scott Gilfoid: Not happy with the progress that he’s making in negotiations with former heavyweight world title challenger Dereck Chisora for their December 22 fight on Sky Box Office, Dillian ‘The Body Snatcher” Whyte (24-1, 17 KOs) says he has the the following fighters as backup options for him to fight: Dominic Breazeale, Adam Kownacki, Jarrell ‘Big Baby’ Miller and Luis ‘King Kong’ Ortiz. Now that Chisora is with new manager David Haye, who is quite intelligent when it comes to promoting and knowing the worth of his fighters, he’s not going to accept less than what he’s worth for a fight against Whyte. Things aren’t going to be as easy now for Whyte to get the Chisora fight as they might have been before he teamed up with Haye. Just how serious Whyte, 30, about fighting any of them is the major question. The guy that Whyte really wants is Chisora, because he’s already offered him $5 million for the fight, and those other heavyweights aren’t going to come up with that kind of money to fight him. Whyte isn’t saying what the roadblock is in his negotiations with the 35-year-old Chisora, but obviously it has to do with the money that the two heavyweights are haggling about. Since it’s so important that Whyte win this fight for him to get the April 13 fight against IBF/WBA/WBO heavyweight champion Anthony Joshua (22-0, 21 KOs), he’e going to need to accommodate Chisora’s wishes if he wants to get this thing done. Chisora knows that he has Whyte with his back against the wall, so he’s willing to sit back and wait for him to fold under the pressure. The thing is, if Whyte faces the likes of Ortiz, Kownacki, Miller or Breazeale, he’ll likely lose, and that point, he can forget about a cash-out fight against Joshua. The UK boxing fans aren’t going to want to pay to see Joshua vs. Whyte 2 no matter how many soft jobs Matchroom Sport promoter Eddie Hearn puts Dillian in with to try and make the fans forget about him losing to Ortiz, Kownacki, Miller or Breazeale. So, it’s pretty important that Whyte fight Chisora, because he stands a better chance of beating him than the above mentioned heavyweights. The guy that Whyte and Hearn wants is Chisora, as he’s the money man, the most recognizable of these fighters to the British public and arguably the least risky of the bunch. However, Chisora know that Whyte needs him BADLY for this fight, so he’s pushing to get the best deal possible. Chisora knows that if Whyte doesn’t make this fight, it could result in a chain reaction that leads to him losing out on the Joshua fight that he wants more than anything. As I was saying, if Whyte faces Breazeale, Ortiz, Miller or Kownacki, he’ll likely lose to all of those fighters, and along with it, he’ll flush down the toilet any chances of him getting the Joshua rematch. I mean, Hearn can be stubborn about it and still shove the Joshua vs. Whyte II fight down the throats of the public on April 13 anyway, but it would be stupid of him. I hate to say it, but you can never underestimate what wacky thing Hearn is capable of doing. The British boxing public already has made it clear that they do not want to see Joshua and Whyte face each other again, but that’s not stopping Hearn from having those two as his leading option for AJ’s April 13th fight on Sky Box Office PPV at Wembley Stadium in London, England. Chisora already arguably beat Whyte in December 2016. The judges gave it to Whyte by a 12 round split decision, but the boxing world saw it as an old fashioned hometown decision for Whyte. Chisora is viewed as the real winner of that fight. With similar judging, Whyte will likely beat Chisora again. With any luck, the boxing fans won’t hold it against Dillian afterwards, and turn up their noses when Hearn matches him up against Joshua on April the 13th at Wembley Stadium in London, England. “I think it needs to be done this week, if it’s going to be him [Chisora],” Whyte said to skysports.com about his need to have his December 22 fight negotiated by this week so they can start marketing it properly. “There’s other options on the table we are looking at. [Promoter] Eddie [Hearn] is speaking to a few people,” Whyte said. I’m going to go out on the limb and say that Ortiz is NOT one of the options for Whyte’s backup plan for December 22. Out of the guys that Whyte mentioned, Kownacki is likely in the lead for the fight due to him being arguably more beatable than Miller and Breazeale. Miller is supposed to be fighting for the vacant World Boxing Association ‘regular’ heavyweight title on November 17, so you can forget about him. Whyte is throwing his name out likely with the hope that Chisora will drop his asking price for the fight. 2012 U.S Olympian Breazeale has little chance of getting the fight against Whyte, because he’s got a lot of size, power and talent going for him. Breazeale’s last two wins over Eric Molina and Izuagbe Ugonoh suggest that he’s a real threat to anyone in the heavyweight division apart from Joshua and Deontay Wilder. Whyte, 6’3″, is on the small side and lacking in power to take on a force of nature like the 33-year-old Breazeale. I’m just saying. “Chisora is a fight the fans want to see, and it’s a fight I want to have, because I want to bash his head in, and just get the stoppage that I should have taken care of the first time around,” Whyte said. I wouldn’t say that Whyte vs. Chisora II is the fight that the boxing public wants to see. I think it’s the fight that Whyte wants obviously, but it’s not the fight that the fans want to see judging by what they’re saying on social media. The fans want to see Whyte face Ortiz, not Chisora. Frankly, it’s still too soon for Chisora and Whyte to get back into the ring with each other after they battled just two years ago in 2016. If the fight had happened five to ten years ago, then it might be a fight that the boxing public would be crying for. But the way things are now, Chisora-Whyte 2 is a tired old retread fight, and nothing more than a pathetic money grab on their part. 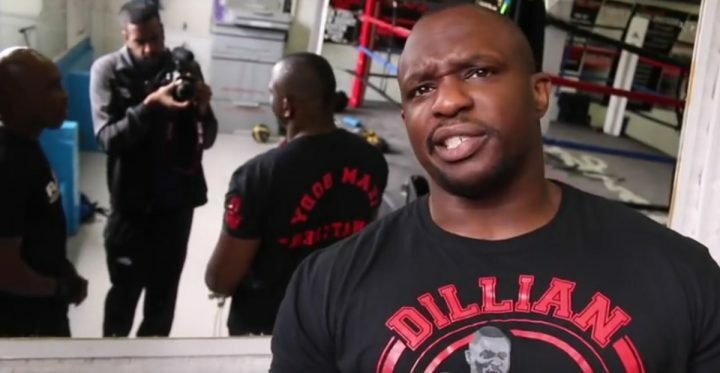 If Whyte had self confidence, he would give the boxing fans the fight they want to see against ‘King Kong’ Ortiz so that he could show what he can go against the #3 best heavyweight in boxing. Deontay Wilder is viewed by many fans as the No.1 guy followed by Anthony Joshua at #2, and then Ortiz at #3. Whyte is seen as the #4 guy by a lot of fans, although he’s starting to slip now that Jarrell Miller is starting to shine with him fighting with his weight over 300 lbs.